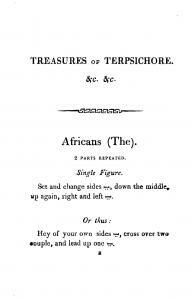 The treasures of Terpsichore; or, A companion for the ball-room. Being a collection of all the most popular English country dances, arrange alphabetically, with proper figures to each dance. By Thomas Wilson, dancing master. This was obtained from the Library of Congress website , where it is presented a page at a time. I have compiled it into a single PDF to facilitate printing and sharing. London, Printed for the author; and to be had of Messrs. Sherwood, Neely, and Jones, 1816. One of several treatises devoted to English country dancing by Thomas Wilson, dancing master to the King's Theatre, this manual consists of an alphabetical listing of country dances and their figures. Lamenting the present state of country dancing, the author fears "it [will] be perverted into a chaos of riot and confusion" (p.iii). Wilson's other manuals on the subject contain detailed text, tables, and diagrams to explain the figures. Their titles include An analysis of country dancing (1808 and 1811) and The complete system of English country dancing (1815? ).